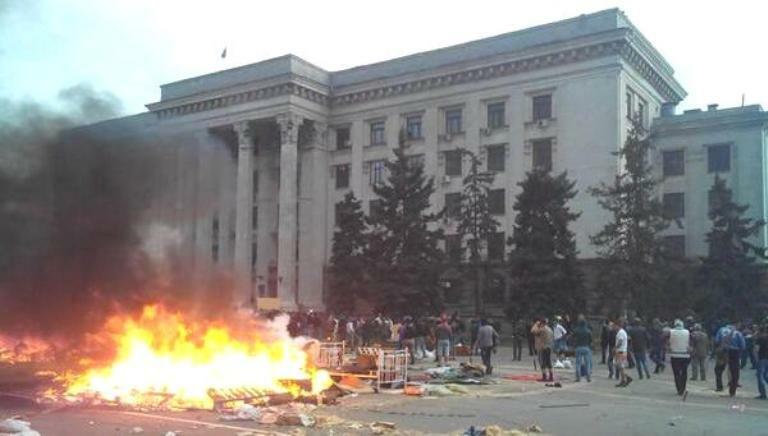 House of Trade Unions under attack in Odessa on May 2, 2014. Links International Journal of Socialist Renewal -- This appeal and article are from Borotba ("Struggle"), an important organisation of the Ukrainian left. For a range of views from the left on developments in Ukraine, click HERE. May 5, 2014 -- May 8 is celebrated all over the world as a day of victory over Nazism that caused millions of losses and much suffering to many people of the world. However, now we see that neo-Nazism raises its head again. Far-right groups and parties are striving to take power in many countries. Their members unleash real terror against the dissenters, migrants, the "others", leftwing and anti-fascist activists. We have to stop the rise fascism again – that’s our duty to stop it before it is not too late. On May 2, 2014, in the Ukrainian city Odessa neo-Nazis and far-right groups unleashed a real massacre. Far-right paramilitaries burned alive and beat to death 46 local residents in the "House of Trade-Unions". They brutally finished off the wounded, shouting "Glory to the nation" and "Ukraine is above all". The neo-Nazis were brought together by authorities so to eliminate the opponents – anti-fascists, members of leftwing organisations and dissenters among ordinary citizens. It happened on May 2 – the day when Adolf Hitler's storm troopers occupied all trade union headquarters across Germany in 1933, and union leaders were arrested and put in prison or concentration camps. The new Ukrainian authorities that violently seized power in February include many representatives of far-right and pro-fascist parties – in fact it’s the most far-right government in post-WWII Europe. Current authorities openly justify Nazis and Nazi-collaborator movement responsible for genocide in WWII. And it’s not surprising that new government immediately released all neo-Nazis who were earlier convicted for racist murders. The government of far-rightists and oligarchs willingly use death squads of openly neo-Nazi groups like Right Sector to suppress the people’s indignation. And the recent tragedy in Odessa – when our comrade anti-fascist Andrey Brazhevsky was brutally killed by fascists - is only one episode in the campaign of neo-Nazi terror. Being whitewashed in the media and endorsed by some governments – far-right squads feel their total impunity in Ukraine. That’s why we call all the anti-fascist forces to condemn the neo-Nazis and to honour the victims of Nazi-terror in Ukraine on May 8 before Ukrainian embassies. The neo-Nazis should be stopped in Ukraine and everywhere. Down with all kinds of nationalism and fascism! May 2, 2014 became the tragic date in modern Ukrainian history. Dozens of Ukrainians were brutally killed, burnt alive, tortured or shot down by Nazi squads. Some of them died during the military crackdown on south-eastern towns. Others were tortured and killed in Odessa where neo-Nazis unleashed outright terror against the opponents and dissenters. As states "Borotba" union: "On the night of May 2, the neo-Nazi Kiev junta ordered troops and units of the Ukrainian Security Service to attack rebels in Slavyansk (Donetsk region). Prior to this, anti-government activists have been arrested in many cities. The leaders of death squads openly say that they are looking just for a pretext to arrest activists of civil society organisations of the popular movement in southeastern Ukraine." Neo-Nazis attacked the camp of anti-junta protesters on the square and set it ablaze. "Activists from the protest camp were forced to retreat to the nearby building of ‘House of Trade Unions’. When trying to kill Odessa residents, ultrarights set ablaze the ground floor of the ‘House of Trade-Unions.' And the fire spread rather quickly over the building. People began to jump out of the windows of the upper floors -- trying to escape the fire. But on the ground, they were finished off by nationalist paramilitaries. Thus, our comrade -- a member of Borotba union -- Andrew Brazhevsky was killed." "The Kiev junta has openly set a course toward violence and carnage against their political opponents. And the tools of this brutal violence are neo-Nazi militants – those who act closely with the secret police, who are well-armed and being financed by the oligarchy. The massacre in Odessa reveals that the Kiev regime of nationalists and oligarchs is rapidly grows into the outright terrorist dictatorship of the fascist style." As reports Russia Today: “Around 1,500 supporters of the Kiev authorities, accompanied by aggressive fans of the local football club, Chernomorets, tried to march through the center of the city chanting 'Glory to Ukraine', 'Death to enemies', 'Knife the Moskals' [derogatory for Russians]. Some of the people in the group were wearing ultra-nationalist Right Sector movement insignia, were armed with chains and bats and carried shields.” Many of those who managed to escape the fire were then brutally beaten by armed men, believed to be from the ultra-nationalist Right Sector group, who had the building under siege. As people were dying in the burning building, some of the pro-Kiev activists jeered on Twitter that “Colorado beetles are being roasted up in Odessa”, using a derogatory term for activists wearing St. George’s ribbons [symbol of WWII victory]. The governor of Odessa region – appointed by junta Vladimir Nemirivsky has justified the actions of murderers, calling them "legitimate". Ironically, the massacre in Odessa happened on the very day (May 2) when Adolf Hitler's storm troopers occupied all trade union headquarters across Germany in 1933, and union leaders were arrested and put in prison or concentration camps. Ukraine's president said on May 2 that "many" pro-Russian rebels were killed and wounded in a crackdown by Ukrainian troops in the restive eastern city of Slovyansk reports USAToday. Video of one of those killed local residents. In Lugansk (eastern Ukraine), where people stormed the department of state security service – and found there in the courtyard a dead body of A. Stasyuk -- local resident and active anti-government protester. The Ukrainian military has also occupied the city of Kramatorsk after an assault. Hospitals are “overcrowded with injured,” one of local activist said, claiming that 10 people died in fighting overnight and two were killed by snipers. In Kramatorsk, a young nurse Yulia Izotova together with other three companions was shot down by Nazis from the "National Guard". In this video you can see how unarmed local residents in Kramatorsk confront column of tanks that entered their town. People chant: "Fascists, get out". However, the Ukrainian junta still continues the neo-Nazi terror in Ukraine and military crackdown on south-eastern cities. The authorities recruit more neo-Nazis into the "National Guard" and form special death squads – battalions "Dnepr", "Storm" etc. -- especially for punitive expeditions. In this video you can see a call of such a death squad created in Kharkov region from militants of Right Sector. The junta of oligarchs and far-right politicians doesn’t stop before any massacre so that to stay in power and receive more billions of International Monetary Fund loans (since oppression of south-eastern rebels is one of the terms of receiving the loans). However, despite of the bloodbath and outright Nazi terror, the people of Ukraine continue the resistance.